Yellowstone National Park: the first and, as many souvenirs would suggest, the best of the national parks. It is also one of the largest and most diverse parks in the continental US. Anyone visiting Yellowstone will spend a lot of time in their car (we clocked 308 miles), but unfortunately many of the tourists we saw barely made it out of their vehicle (we cringed when we saw “How to Photograph Yellowstone From Your Car” being sold in one of the gift shops). Your Yellowstone experience should go beyond the boardwalk: don’t be afraid to try some longer hikes or lesser-known areas of the park. 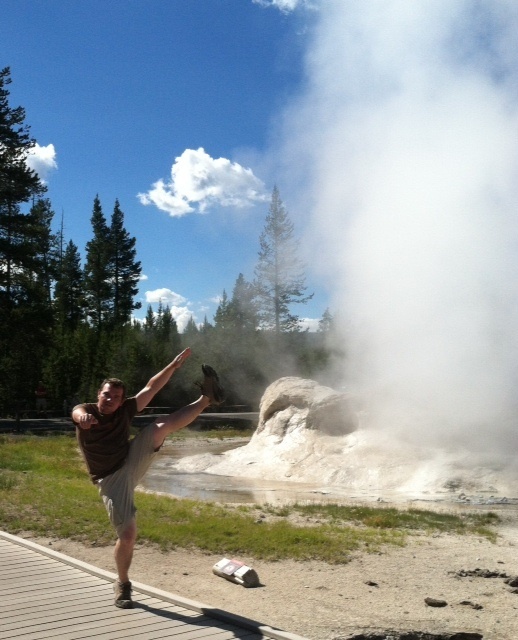 See: Geysers, hot springs, paint pots, and fumaroles…Yellowstone contains over half of the world’s geothermal features. We particularly liked walking around the Norris Geyser Basin. Note: unless you want to spend your time fighting SUVs and minivans for a parking spot, we suggest avoiding the middle of the day, particularly since it is still light in July at 9 o’clock. See: Lower Falls of the Yellowstone River from anywhere along the canyon rim. See: Old Faithful Inn. Opened in 1904 and built in the “National Park Rustic” architecture style (or as one ranger called it: parkitechture), it is one of the world’s largest log buildings. Do: Mt. Washburn trail. Beginning at Dunraven Pass (there are two starting points), this strenous 6.2 mile hike offers sweeping panoramas the entire way up to the Mt. Washburn fire lookout, with 360-degree views of the Park at the top (on the day we hiked it, you could see the Tetons 75 miles away!) Note: the trail follows an old gravel road making it a continuous steady climb. This entry was posted in High Kick Photos and tagged High Kick, hiking, Mt. Washburn, Old Faithful Inn, Yellowstone geothermal features, Yellowstone National Park. Bookmark the permalink.